I have been known to lose things. In Junior High it was my jean jacket (ok there may have been more than 1, or 2 or even 3 jackets that got left on a sports field). In college my school ID (which enabled me to get in and out of my dorm) occasionally disappeared. It was a cold environment, maybe my ID went on vacation someplace warm? 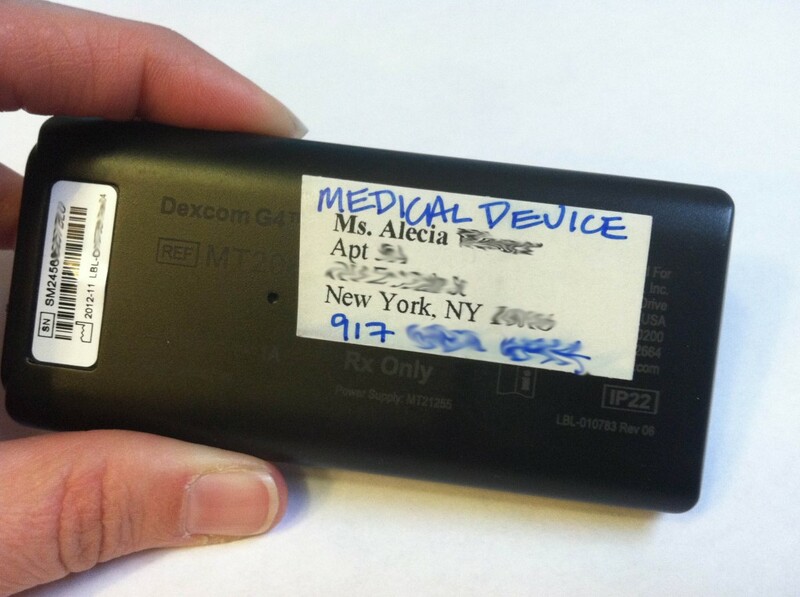 If you happen to follow me on Twitter, you may have witnessed my upsetting day in December (read: freaking the eff out) when I lost my Dexcom 7+ receiver on the subway. It was 12 (my favorite number) days before I was due to upgrade to the Dexcom G4. It also happened to be 12/12/12 which possibly made me cry harder (brutal end to the day). Yes, it is legible on my Dex but putting my address and phone number on a blog seems like a rather bad idea. Also, my business card is tucked into the awkward Dexcom G4 case too. Not a Wordless Wednesday post but how about a Wonderful Wednesday Tip? Today I am D hidden. 3 of my D “accessories” are under my dress. My pump is tucked into the left hip of my tights, my pump is connected to a pink Inset on my tummy, and there’s a Dexcom G4 sensor with some rhinestones on the back of my right arm. Two people have commented on my necklace which is on full display. Both thought it was some type of stone or quartz. Nope. 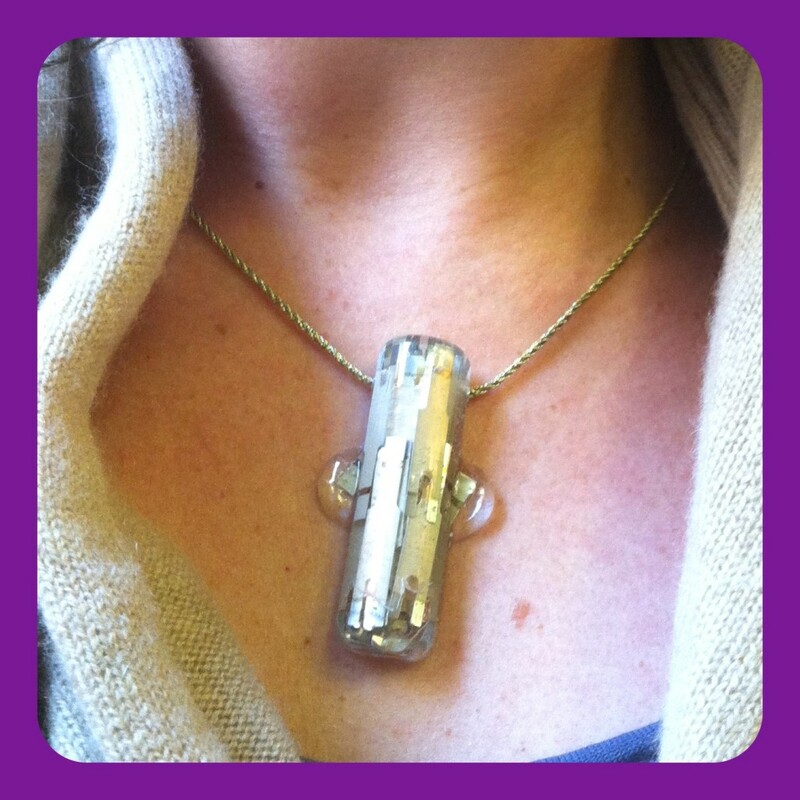 It’s my used Verio IQ bg test strips (made into a pendant necklace). Just some images that explain this week (and happy Friday). From top left: NEW D toys matched up for the first time since my robot self was upgraded in December. I love that they matched at an awesome number (yes, I have doggie sheets). My Dec G4 sensor was more OFF than stuck ON me by Tuesday. I was waiting it out since I still hadn’t received new sensors and was growing concerned. I’d only received 4 sensors with my initial shipment (unlike my 7+ where I got 3 boxes from the beginning). Look what arrived! Yep, a phone call and less than 48 hours and *presto*! Sensors Ahoy! It’s Friday which means Blue Friday and me taking off pics of myself at my desk. Since it is FREEZING in my office, I will be wearing this cozy scarf all day and possibly gloves and my hat with ear flaps. Since switching to the Verio IQ meter and Dexcom G4, this is the very 1st time this has happened (yes this happened Monday, what of it?). Girl #1 was standing closest to me. As I attempted to open my jerk of a gym lock, the back of my arm was directly in her view. She saw the Dexcom sensor and was distracted enough to cause her to lose her thought as she conversed with her friend. As Girl #2 asked her what the heck she was talking about or if she was even paying attention, Girl #1 frantically tried to motion with either her eyes or head or both, to her friend what she is staring at without saying anything (being polite). Then Girl #2 saw it and my lock finally opened. They returned to talking sort of, but were staring. Also note, in this scenario, the Dexcom sensor could be replaced by insulin pump or the Dexcom receiver resting on the bench. One of these devices has caused an interruption in someone else’s conversation. Last night though, I got my lock open (on the second try. Woo hoo) and the 2 girls did NOT resume their chatter. I threw on my scarf and coat and turned to leave. 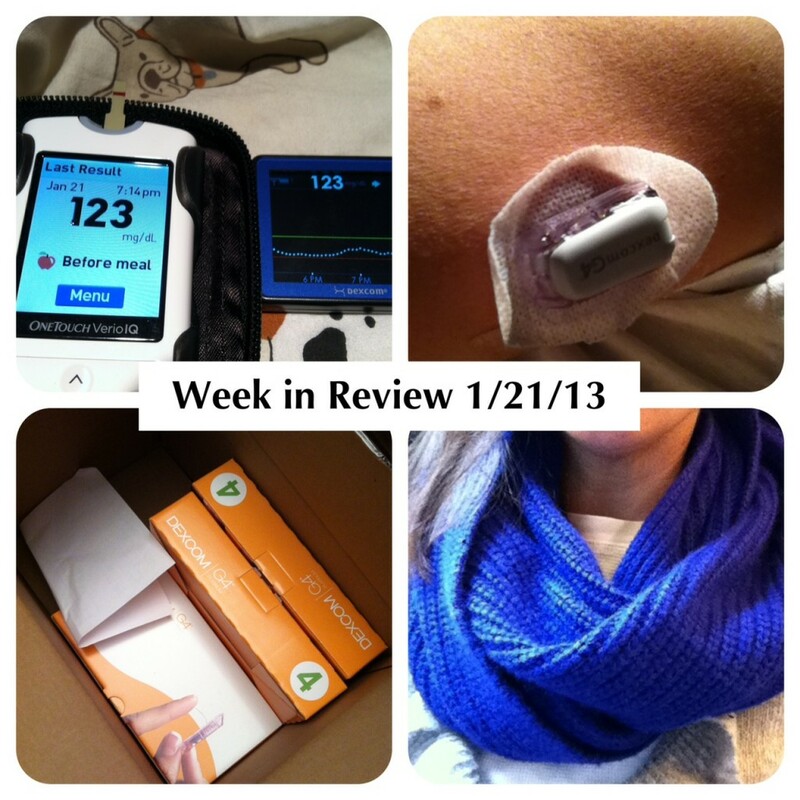 I took one step and heard a voice, “Is that a continuous glucose monitor?” WOW was I shocked! When I had the Dexcom 7+ there was the occasional, “What kind of phone is that?” or a finger pointing at my arm followed by, “Hey does that play music?”. This time was different. 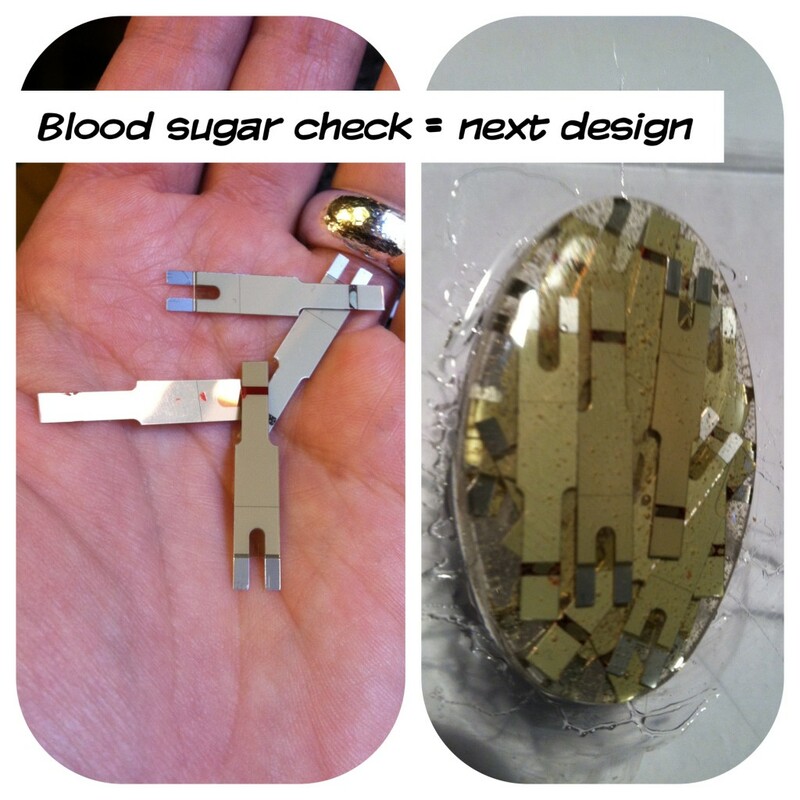 A continuous glucose monitor? OMG, yes… was this one of MY people? A sibling or friend of one of MY kind? Or someone in a D related profession? I spun around and with people walking around me (6pm at the gym in January is nuts I tell you). I told her it was a CGM and she asked if I liked it. As I started to answer I realized I had both girl’s undivided attention now (along with some other ladies at their lockers) and explained my Dexcom G4. 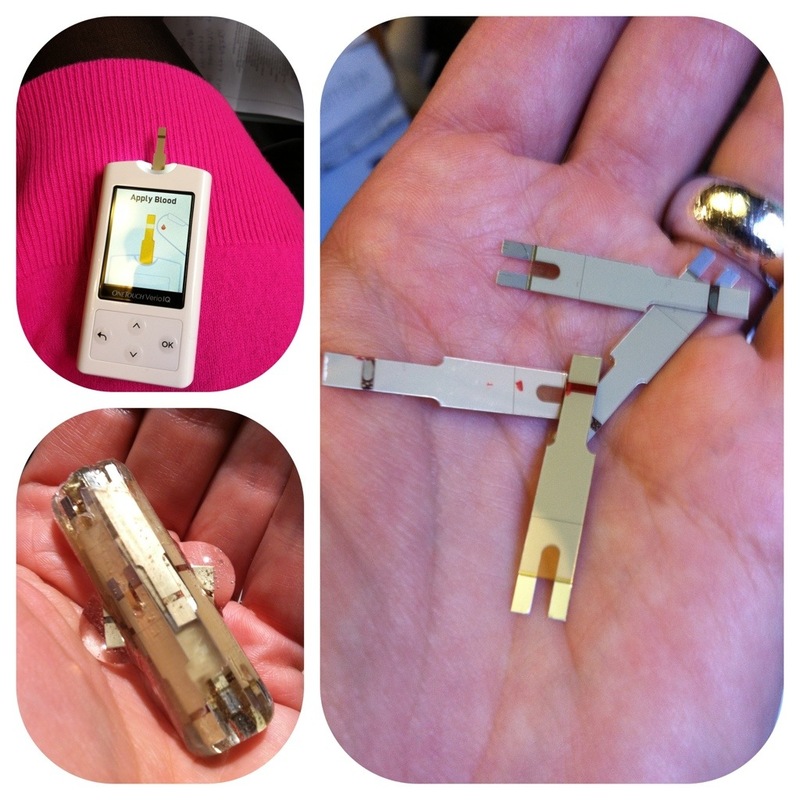 I told them about my previous experience with a Dexcom 7+ and how less cumbersome the G4 receiver was. I showed them the screen and felt a sigh of relief when I opened that silly snap case and saw my bg. I’d suspended my bolus during my workout and now was at 104… whew. Her friend asked if I still had to “check my finger”. They both looked a little disappointed when I said how the Dex needs to be calibrated via blood check. i also explained that the Dex can be “off track” and I can’t trust it over my meter when it comes to bolusing but how incredibly helpful I’ve found the trending arrows. The original conversation starter said she noticed my pump and that she isn’t on one. Ahhhhh, she WAS one of my people! And as soon as she said it, her friend added “Yet” and a big smile. I told them stories of sleeping through a low warning on the Dex 7+ and my boyfriend hearing it and waking me up. I told them about how what I intend to eat and what I actually eat at a meal can really vary and I’ve found using a pump has made those times run smoother. The friend (aka Girl #2) asked when I went on a pump and I saw the look on the face of Girl #1. I remember making that very face. Curiosity mixed with fear. I explained how I’ve been diabetic since I was six and I decided to go on a pump after college, in my mid twenties. I used all my mentoring JDRF skills mixed with common sense… I explained how it was the right time for me when I decided to get a pump and many people are perfectly successful on MDI. How I’d flip-flopped back in forth for 2 years trying to decide if I wanted to be a pumper. How I’m glad now that I made the decision but that I had to do it for myself, in my own time, and not be pushed to do it. I saw the look of relief on Girl #1’s face. I wasn’t selling her on it, I was just answering questions and telling relatable anecdotes about my BF eating food off my plate and having the ability to bolus incremental amounts through a meal has been an enormous help to me (like I’m dating the Hamburglar or something). Girl #2 said if you go on a pump you can always go back to shots right? I explained how the pump is expensive but mine was covered by my insurance and how I knew people who took pump breaks and go on shots for a bit. I also explained how I had zero desire to take a pump break and the only time I did was when my pump actually broke and I laughed at my own joke about pump-breaks vs pump-broke (yeah I laugh at my own jokes, so what?). We chatted a bit and I told them how I’m usually at the gym at this time on a Monday night if they had any more questions, and then it happened, Girl #2 reached across the bench, shook my hand and told me her name. We all exchanged names and I left, but I kept thinking about what had just occurred as I rushed home (and I regretted that i didn’t give them my business card or contact info). 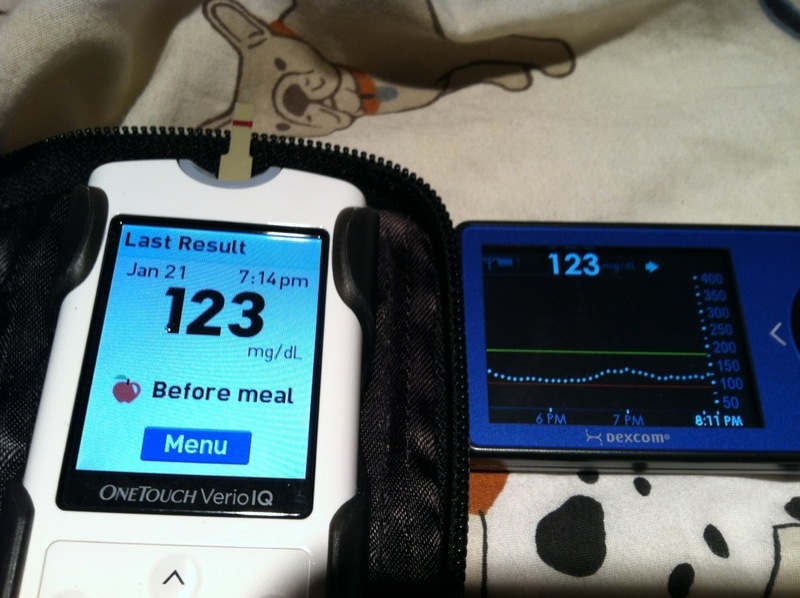 I’ve spoken to many people over the years about both my using insulin pumps and adding a CGM into my diabetes care. I’ve spoken to friends-of-friends, I’ve spoken as a JDRF Mentor, and I’ve spoken to people considering pump therapy at the request of my doctor’s office, but I rarely (read:never) get to meet THE FRIEND. This morning I was thinking about The Friend again. I was lucky. When I finally decided to take the pump plunge 12+ years ago, I was still dating my college boyfriend. He’d lived through my year long thesis project on a non-invasive glucose monitor/ insulin dispensing system. He’d watched the Minimed videos with me (yes, I said video, as in VHS tape, I am old, what of it?). Years later when I found myself curious about insulin pumps, and deeply investigating options, he’d been the support I needed to take a leap of faith and learn something new. THE FRIEND. I hope I see those girl’s at the gym again. I hope I see THE FRIEND. That person who doesn’t flinch at D stuff. That one person who may not get it, but who is there. THE FRIEND deserves a pat on the back. If this Flu season-everyone-has-a-cold stuff didn’t make my germophobia at a level 10, I’d say THE FRIEND really deserves a hug. Screw germs, hug THE FRIEND. 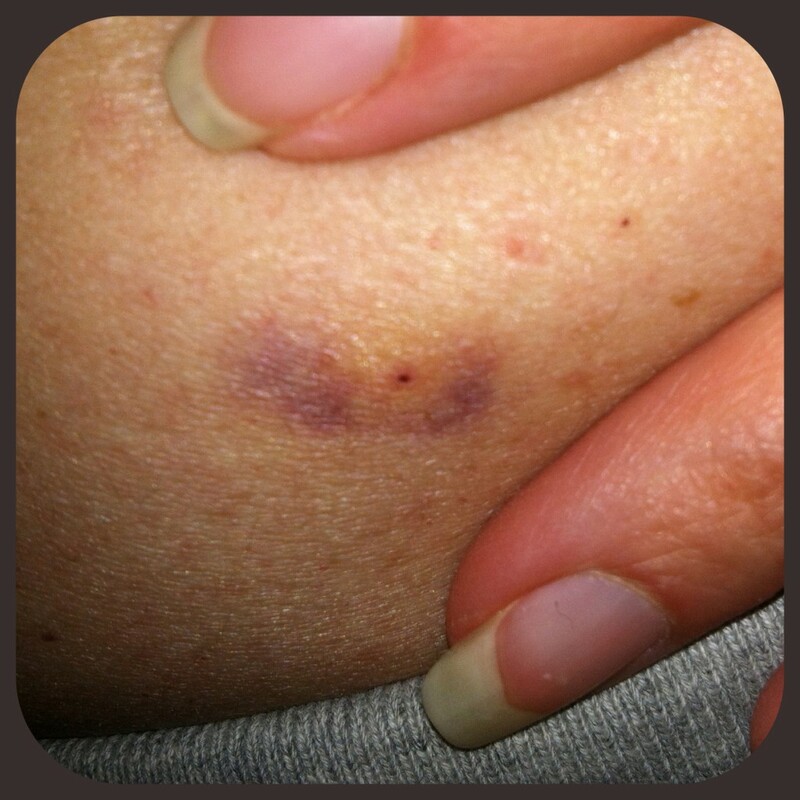 That’s the bruise from the pump site I replaced yesterday at work. It was hurting a little while at work. I replaced it in a dimly lit conference room, wore 2 “sites” the rest of the day and removed the old one when I returned home. Tonight I noticed the bruise. My tummy was sticking out between my shirt and sweatpants. I was sitting Indian style on my floor while working on a rather messy jewelry design project. Rather messy is the nice way of saying “What-the-heck-happened-in-here?” and “This-will-never-truly-be-cleaned-up-will-it?”. 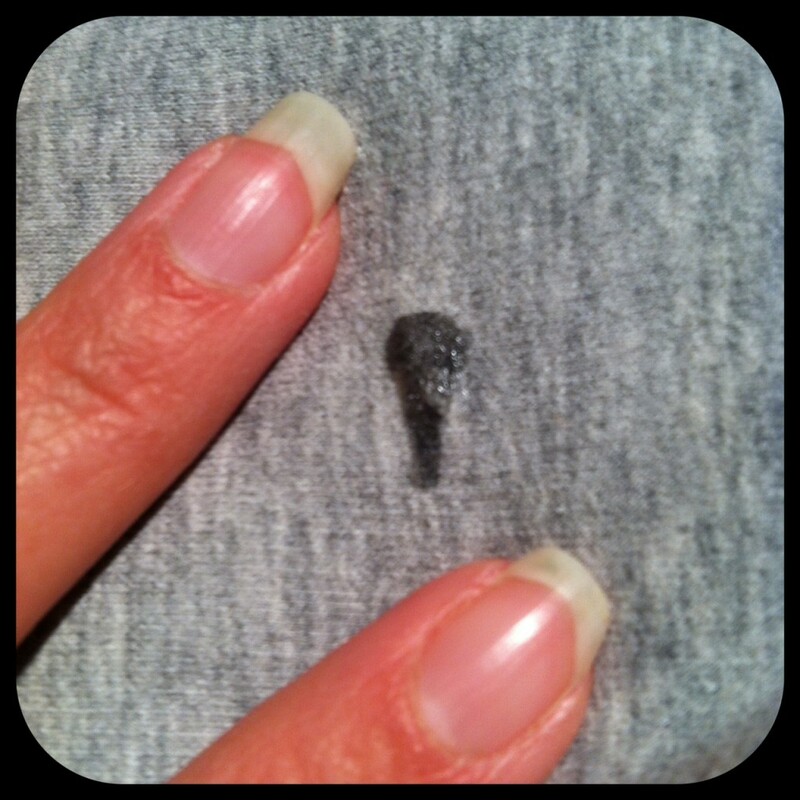 I wanted to pull down my sweatshirt but my hands were covered in stickiness (used a paper towel and a knuckle to take the pic). I adjusted my shirt over my stomach and jumped right back into mess making 101. 20 minutes later, I took a break. Then I noticed it…. “NO!!!!!!!!! !”….Seriously, NO! A pump bruise is nothing, but resin on my favorite, super cozy, softer than soft sweatpants?? ?